This weekend I'd like to introduce you to something new on The Meandering Musings! 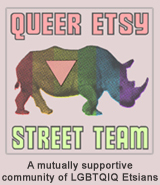 When visiting Etsy, the site offers a number of different ways in which you can shop through the variety of artists, artisans, vintage collectors and more that are hosted on their site. You can perform a search, with your results sorted by relevancy or by what's newest and freshest on the site. You can browse through different categories. You can sit and watch the Time Machine and see what everyone is listing as they list it. My favorite of these options it to browse the Treasury, though. The treasury is a place where members of the site (buyers and sellers alike) can curate a sixteen-item collage of items to be displayed for others to browse through. People do this by themes based on color, the seasons or any other theme at all and I personally create a few of these each week. Starting this weekend, I'll be randomly picking one of those treasuries I've created over the week to share with you here on The Meandering Musings! This way, I'm not just introducing you to one particular artisan or artist on that day, but once a week I'll be introducing you to sixteen of them! I hope you enjoy this new addition to the blog! I'd love to hear your opinions in comments! Click on the picture to be taken to the treasury where you can browse individual items you see pictured and the shops of the artists and artisans behind them!